With over 20 years of experience in the industry, Power Vac is Novi's most trusted family owned and operated air duct cleaning company. With two decades experience, more five star ratings than any of our competitors and a highly trained staff, Power Vac is the company you can trust to clean and maintain your home's ductwork and you can trust that Power Vac will satisfy any questions or concerns that you may have before, during and after your cleaning. From eliminating constant dust issues, to helping alleviate allergies and asthma, we keep our prices low so everyone can afford to benefit from having their ductwork cleaned professionally. We are not interested in being the largest company around, we want to be the best. 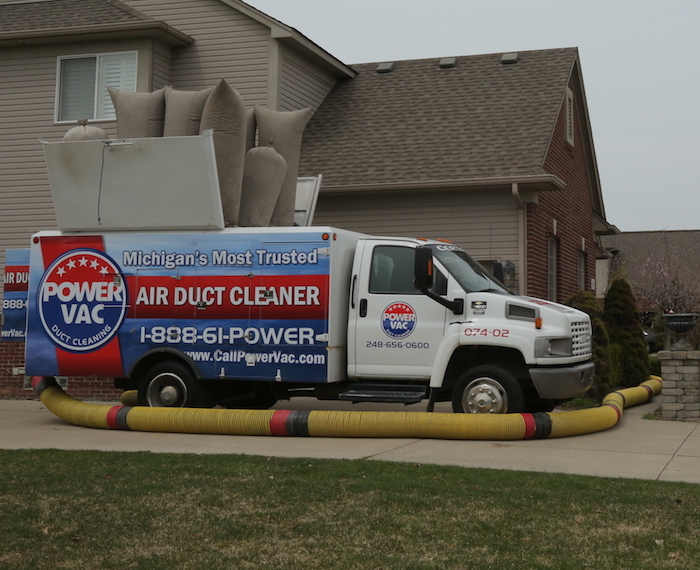 It's no wonder why we have been voted Michigan's most trusted air duct cleaner year after year! Why Choose Power Vac to Improve Your Home's Air Quality? Use only the most advanced equipment available. 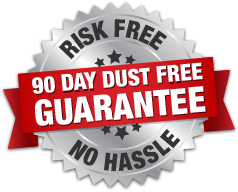 All jobs come with a 90-day dust-free guarantee. Employ highly trained and professional technicians. We're a local, family-owned business. Offer competitive prices and reliable scheduling. Polluted indoor air is a leading cause of illness. Protect your health with cleaner air! The truth is that residential or commercial duct cleaning is actually quite important in order to make sure that your family or employees stay healthy. We commit ourselves to providing the best customer service possible. We make sure to take the time to explain the air duct cleaning process to all of our customers, so that they know what is going on. The technicians will always show up to your home in uniform and completely professional in their behavior. We use superior equipment, and our process is extremely efficient, as we have optimized it through many years of experience. We are devoted to giving all of our clients a safe and natural alternative while cleaning their air ducts. 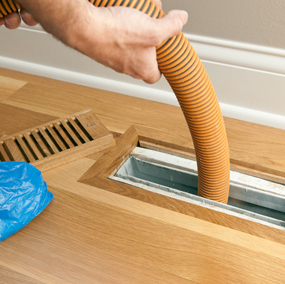 Power Vac's air duct cleaning process starts with a consultation, after which our technicians will tarp all of the corners that connect the garage to the basement, and then a 10-inch vacuum hose will be connected to the furnace from the truck. The truck will be engaged in the process as well, and 12 large airbags will come out of the top, indicating that your property is now under negative pressure, with a powerful vacuum coming out of all of your vents. During this process, the technicians will take pushrods with compressed air of 300 psi to every one of your registers and push debris down the lines and into the trunks. Here, the debris will be vacuumed out and go into the truck. In this way, our process will clean the air of your home and take any dirt that has been compromising air quality away with us. We are a licensed, commercial and industrial air duct cleaning company with over 20 years experience in the field. We have been honored with numerous awards and have earned all of the necessary certifications needed. Our technicians are trained and have experience in the protocol that must be followed in high security clearance buildings such as: hospitals, universities, government buildings, day care centers, banks and more! Rest assured, we are the right choice to properly inspect, repair and clean any and all ductwork no matter how small or how large. We are an industry leader and have been chosen by some of the largest companies in the nation to maintain a healthy work environment for their employees and customers. I placed a call to Power Vac for a duct-cleaning estimate. I had called several others and the Representative for Power Vac by far was the most informative about the service they offered. When I asked for available appointments, the representative over the phone offered a "fill-in" slot for someone who had canceled their appointment for the day and a "friends and family" discount for taking the newly open slot, which was an amazing deal, I explained to them that I have young children in my home and if the could come after nap time and she agreed, which I found very accommodating. Contact us today to get a fast, free phone estimate for all your residential, commercial and industrial air duct cleaning needs!